I'm enjoying another Glitrix polish today. 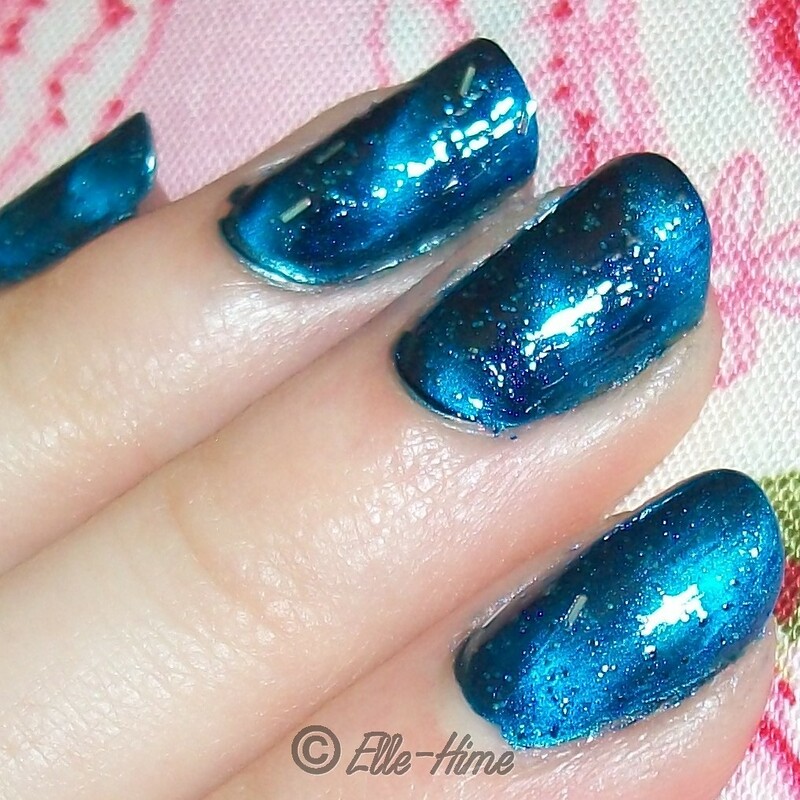 The color is called Oceanic, and it is a blue jelly franken with small blue glitter and silver bar glitter. This is my second time wearing it and I have to say I just love it! Have a bit of cute bottle picspam! 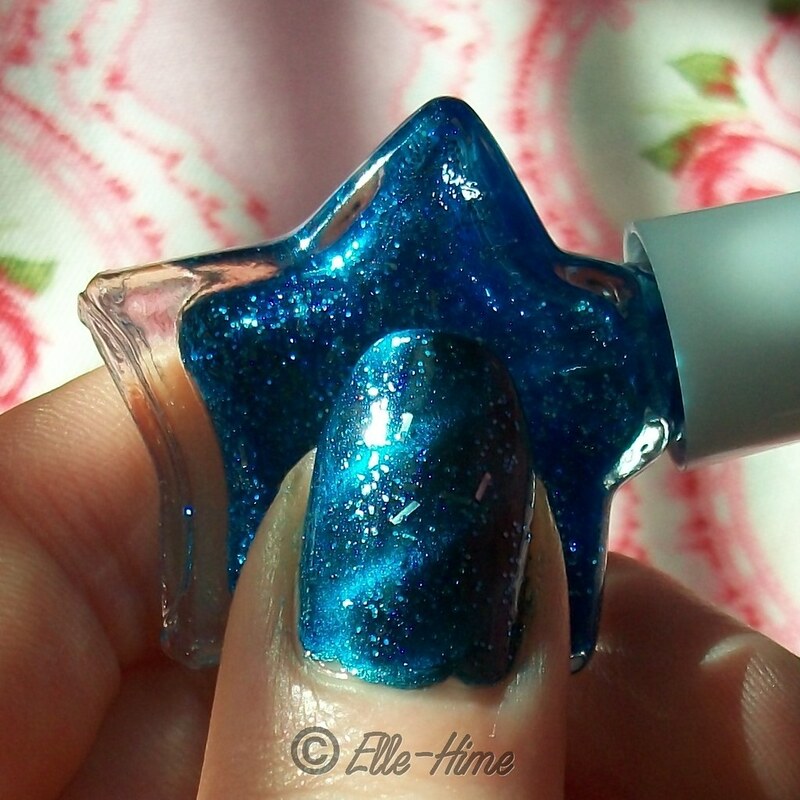 I have some nail wheel swatches of this one, as well, as it is really good for layering. 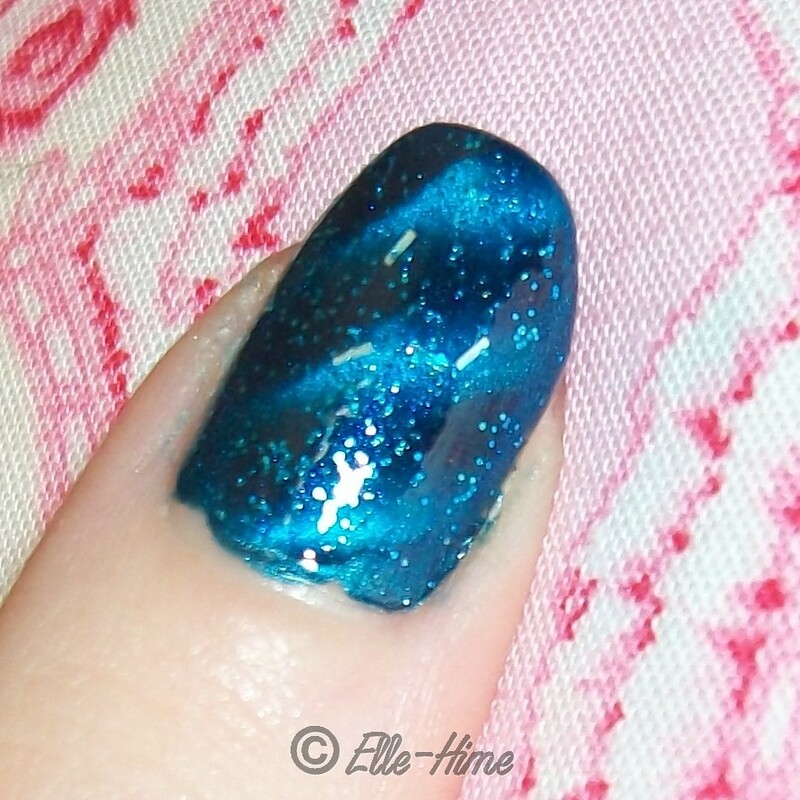 Oceanic dries to a gorgeous glassy shine and the glitter isn't gritty at all. My photos show it without top coat, but I do like to add one to enhance the smooth shine even more. Left to right: 1 coat of Oceanic over China Glaze Caribbean Blue, 2 coats over L.A. Girl Alkaline Blue, 1 coat over L.A. Girl Alkaline Blue, 1 coat alone, 2 coats alone, 3 coats alone. Personally I would be wearing this layered - the jelly base stays sheer even though it is streak free at two coats. When you're putting it over another polish you only need one coat for good glitter coverage, two if you want more glitters or more depth. 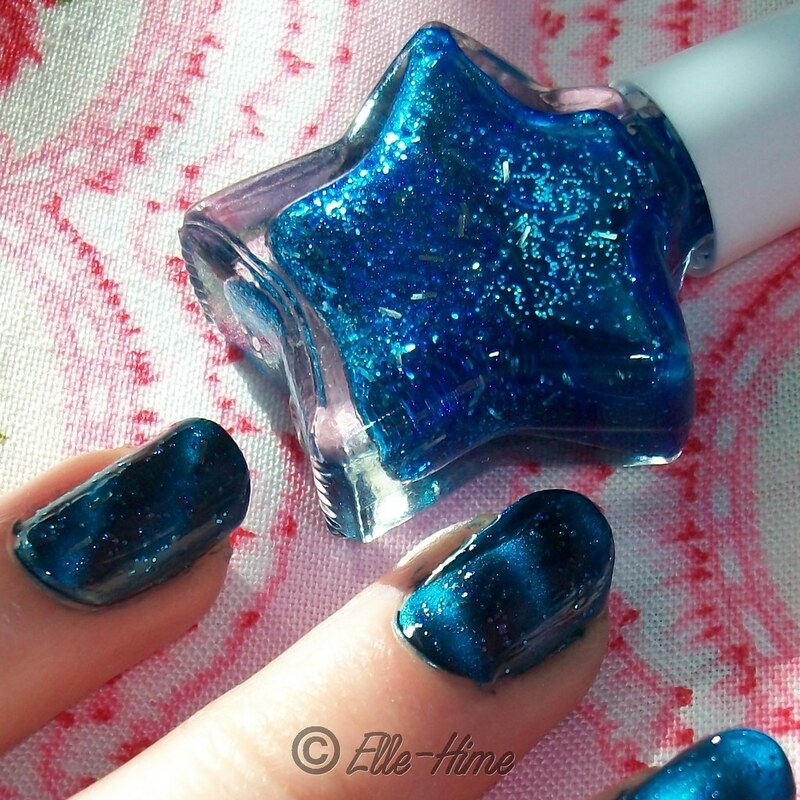 Bar glitters are unpredictable in polish and you occasionally have to fish them out of the bottle. The brushes in the star bottles have clear hairs so it is really easy to see how many you've caught! 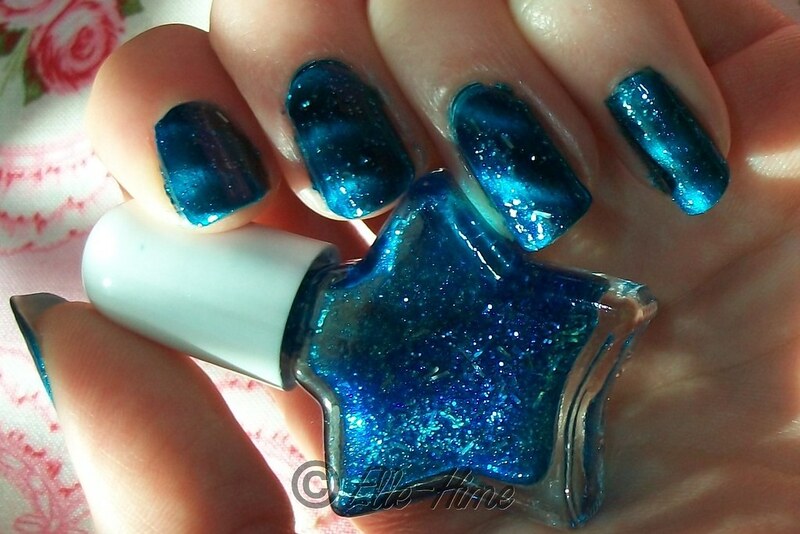 Glitrix Oceanic is a great color because the glitter pops over any base color. Over something dark the blue glitter is light enough to pop in a very striking way. The glitter settles in the bottle and I find the easiest way to mix it is to put it on it's side and keep flipping it over, give it a shake, stand it up and you're good to go. After painting a few nails shake it again to make sure you're still getting the bar glitters you want. This polish applies wonderfully and dries pretty quick. The jelly base color will tint whatever you put it over, in my case of using it over Layla Metallic Sky it brightened the polish to the exact shade of blue I was hoping for! I love it over my magnetic polish with line designs like waves. Doesn't the glitter remind you of little fish swimming through bubbles? I have to say that if you're planning to place an order for Glitrix polish, which you can buy here on etsy, don't pass this color up! It is a real gem. =) Who can resist something so sparkly? !